Join Yamaha for a press demonstration showcasing the world’s most advanced networked entertainment technology: Yamaha RemoteLive. This unique display will preview the streaming technology that is the driving force behind Jazz Crossings, an upcoming live transcontinental piano concert that will link Internet-connected pianos, audiences and performers at The Wild Beast music pavilion in Valencia, California with the Yamaha Piano Salon in midtown Manhattan. Presented by CalArt’s David Rosenboom, the demonstration will include excerpts from Rosenboom’s original composition Is Art Is, as well as Crossings, which features salsa music interspersed with the voices of those who have crossed borders to live in the U.S. The performances, originating in The Wild Beast, will be seen and heard in the Yamaha Piano Salon via Yamaha’s RemoteLive technology. Data from a Yamaha Disklavier piano at The Wild Beast will be merged with audio and video streams and transmitted to New York via the Internet and reproduced on a second, linked Disklavier performance reproducing piano synchronized with projected video and audio, live and in real time. Given the tremendous consumer demand for Netflix, AppleTV, Roku and similar streaming technologies, Yamaha's pioneering RemoteLive technology provides an exciting, historic, networked, Internet-ready entertainment experience. Now, a pianist can perform live in one location and have his or her exact keystrokes and pedal movements transmitted to one or more networked, Disklavier-enabled pianos anywhere in the world. Learn more at disklavier.com. David Rosenboom is a composer, performer, conductor, interdisciplinary artist, author and educator, known as a pioneer in American experimental music. He holds the Richard Seaver Distinguished Chair in Music in the Herb Alpert School of Music at California Institute of the Arts where he has been Dean of the School of Music and Conductor of the New Century Players since 1990. 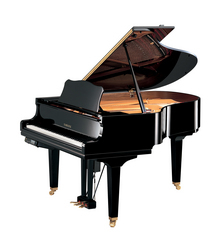 Yamaha Piano Salon at Yamaha Artist Services, Inc.